You don't have to spend a fortune to purchase a beautiful engagement ring. From multiple-diamond settings to beautiful diamond alternatives, there are lots of ways to save money without sacrificing style and meaning. For purchasing information, click the "Buy Now" button on any of the following slides. With all the sparkle of a diamond at a fraction of the cost, cubic zirconia is a great way to save on an engagement ring. This pretty sterling silver ring features an emerald-cut center cubic zirconia surrounded by more pave-set gems. It retails for $50. Cubic zirconia looks luxurious, especially when it's set in glowing sterling silver band. The centerpiece of this stunning ring is a round cubic zirconia, which is flanked by smaller round cz gems channel set in the silver band. It has a total carat weight of 1.5 and retails for less than $50. An invisible setting is a great way to give the impression of a larger center diamond by setting several smaller gems very close together. This 0.11 total carat weight 10k white gold ring resembles a larger princess-cut solitaire for a fraction of the price, but it actually features four tiny princess-cut diamonds instead of one larger one. It retails for about $170. You don't have to choose a lab-created center gem to get major impact in an inexpensive engagement ring; colorless white topaz is all-natural and equally stunning. This pretty 10k white gold ring features a sparkling 1.2-carat oval white topaz and retails for about $240. There's nothing like the classic diamond solitaire for brides-to-be who love simple elegance. This beautiful ring features a 0.25-carat, princess-cut diamond set in a simple 14k white gold band. It retails for just over $300. Two-tone gold can give an affordable ring a focal point, making the size of the diamond less important to the design. In the case of this unique ring, a 1/10-carat solitaire is set in 10k white gold with a rose gold band. This pretty design retails for $270. Titanium is a modern alternative to gold, and it can make your ring much more affordable. This contemporary design features a 0.24-carat, round-cut diamond tension-set in a titanium band. It retails for about $280. If you love the exquisite beauty of Art Deco style rings, you don't have to spend a fortune to get your dream design. This delicate ring features a center princess-cut diamond flanked by channel set diamonds in a 14k white gold band with beautiful Deco-style engraving. It has a total weight of half a carat and retails for about $380. A focal point of a round cut morganite stone surrounded by small diamonds in this flower-like ring packs a visual punch. 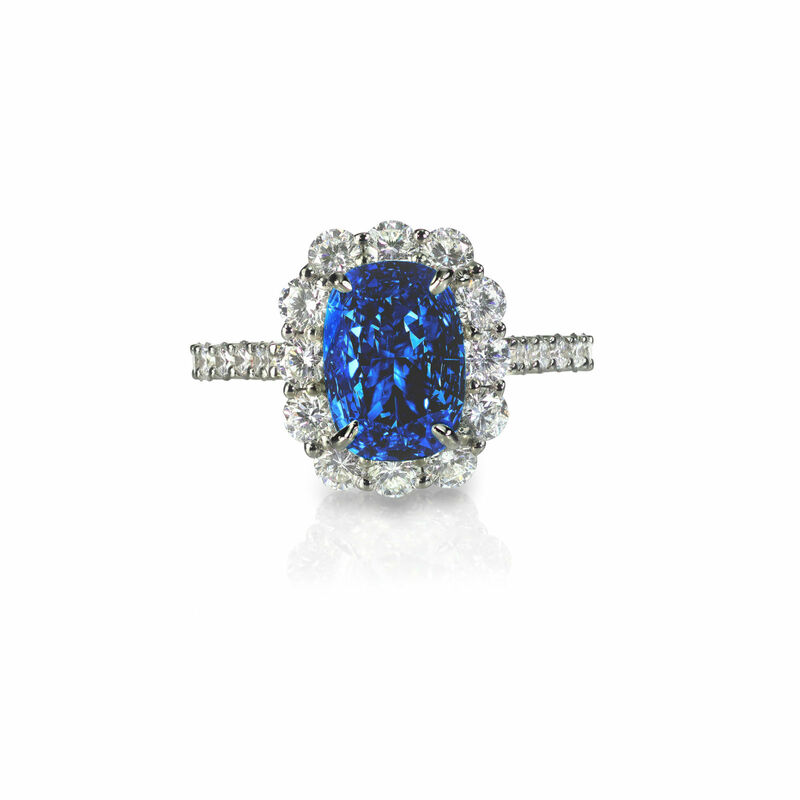 This beautiful ring features 1 total carat weight of stones. The 14k yellow gold band is a classic touch. This pretty ring retails for about $400. Several smaller diamonds make a big impact for a lower price. In the case of this gorgeous 14k white gold ring, three round-cut center diamonds are embraced by top and bottom swirls of more diamonds. This ring has a total weight of half a carat and retails for about $430. For major impact, choose a diamond alternative like precious aquamarine. This stunning 14k white gold ring features a large oval-cut aquamarine surrounded by a halo of small white sapphires, giving it a total carat weight of 1.21. It retails for about less than $300. Whether you choose a cubic zirconia engagement ring or a creative diamond design, there are lots of splendid options that won't break the bank. Ultimately, choosing a ring you will love for years to come is far more important than spending a fortune on a piece of jewelry.